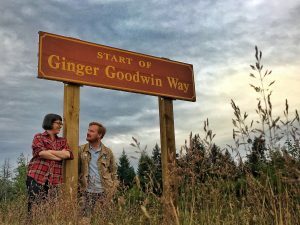 100 years ago, 31-year-old labour organizer Albert “Ginger” Goodwin was shot and killed by special police constable Dan Campbell as he hid in the hills above Cumberland, BC. Goodwin and others in those hills were evading conscription to WWI – a war he considered unjust and unnecessary. He had previously been rejected for the army due to poor health, but declared fully “fit for combat” when summoned a second time. 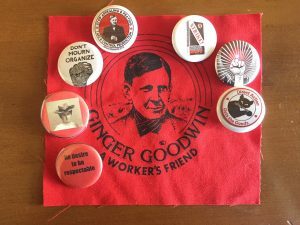 Upon news of his death, the community and broader labour movement were outraged, convinced that Goodwin had been murdered for his union activism and persuasive socialism. 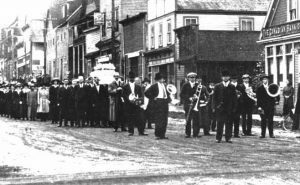 The labour martyr’s funeral procession was over a mile long, and his death honoured with a one-day general strike in Vancouver. 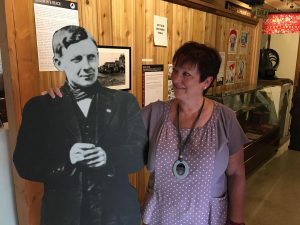 For the last 33 years, the community has gathered for Miners Memorial weekend to commemorate Goodwin’s death and recognize so many others who lived, struggled and died in the coal mines of the area. 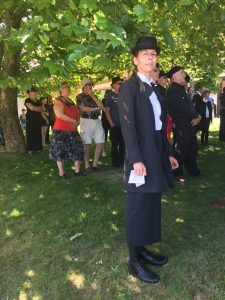 The BC Labour Heritage Centre was well represented June 22 – 24, 2018 which focussed on the centennial of Goodwin’s death. Board members Karen Ranalletta, Joey Hartman, Aaron Ekman and Kari Michaels, were there, along with former board member Irene Lanzinger. Several BCLHC volunteers also enjoyed the weekend. 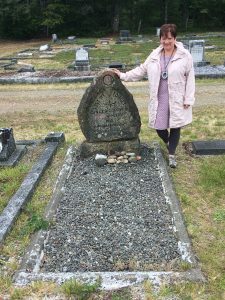 A full three days of activities offered workshops, guided walking tours, graveside vigils, music, theatre, and opportunities to make buttons and make a silk-screened image of Goodwin. Participants learned not just Ginger Goodwin’s story, but also many stories of his contemporaries and the political context of the time. A history talk about Cumberland by local experts Marianne Bell and Robin Folvik. The village was first called “Union”, named after a coal company but still appropriate. There are many markers, plaques, cairns and monuments recognizing the workers of Cumberland. Professor Mark Leier from SFU presented on the history of the Militant Minority and lessons from Goodwin about the value of socialism and radicalism. “Songs of the Workers” welcomed various musicians to share workers’ songs and poems. The annual ceremony at the Cumberland Cemetery, where BC LHC laid flowers on Goodwin’s cairn. 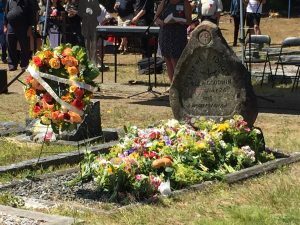 Flowers were also laid on the graves of hundreds of other miners – including Japanese and Chinese workers – who died in explosions and other disasters. 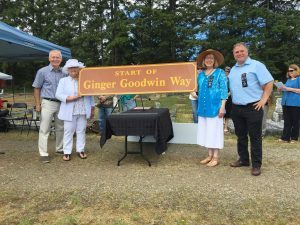 Minister Scott Fraser, MLA Ronna-Ray Leonard, and MP Gord Johns announced the re-naming of a section of the Island Highway as “Ginger Goodwin Way.” Removal of the previous signs was one of the Gordon Campbell Liberal government’s first acts upon their 2001 election. 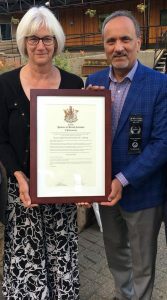 The government representatives also read a proclamation that July 27th is Ginger Goodwin Day in BC. 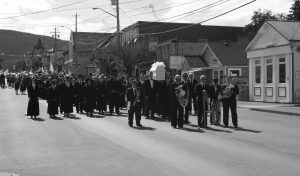 All took part in the historical re-enactment of Ginger Goodwin’s funeral procession along the main street of Cumberland. Many mourners wore appropriate garb and the white coffin was carried behind a brass band much like 1918. This event was a great testament to the people of the Comox Valley who respect the importance of working people’s history. They remember those workers who died for their rights, who were political targets and who did not fear the boss. As Goodwin wrote before the two-year Great Coal Strike began in 1912, the workers were forced into “terrible conditions” by a “class of parasites (that) has been living off the blood of the working class.” Miners and their families, evicted from company housing, were forced to live in tents for 23 months and faced starvation. The government responded by sending militia forces to assist the bosses, and a trainload of dried beans for the strikers. We too, remember, and appreciate the opportunity to be part of Miners Memorial.